Anne and I decided to eschew the big box stores and do some creative things for Christmas gifts--Anne felted soap, made liquid soap, and baked cookies, and we both worked to create this cooking guide, entitled Savor: Natural, simple, healthy. It's a little book filled with tips about really easy ways to prepare fresh food, and lots of photos to whet your appetite. If you click on the picture to the left, you'll be taken to the website of Blurb, which printed the book. You can click through the first 15 pages and get a taste. And if you like, you can order one! It was a fun and relatively easy project, and we were thrilled with the quality of the photos and with the book as a whole. If you ever want to make your own book, you can just use their free software, your own photos, and their page templates, and hey, presto! You've made a book! And if you have any questions, feel free to contact me and I'll walk you through the process. Roast a bunch of beets (scrubbed, trimmed, and then in the oven at 375 for 1.5 hours in light coating of olive oil, salt and pepper). 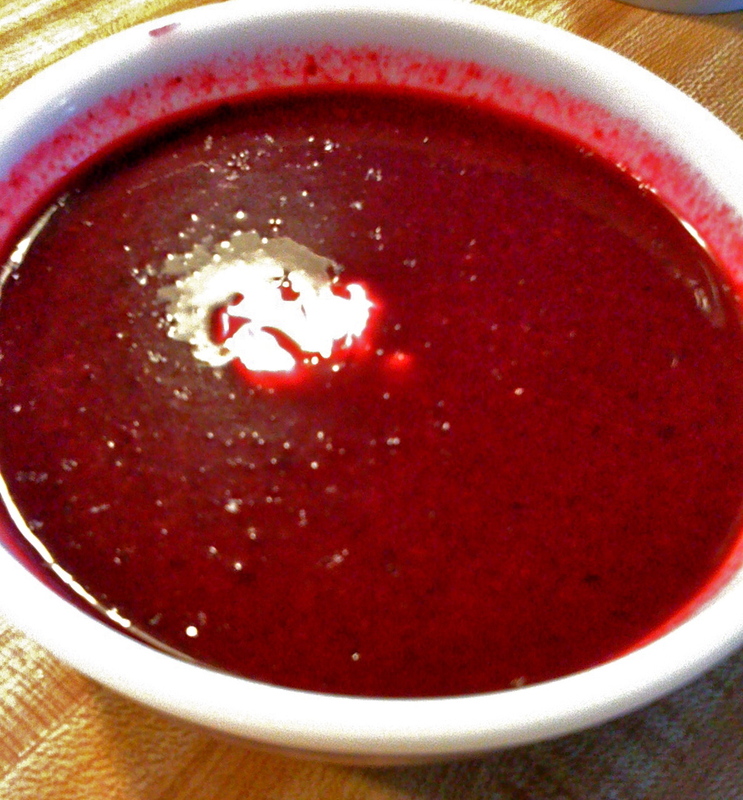 When beets are done: In the bottom of a soup pot, sautee two big onions (chopped), and when they've sweated a bit, add a little garlic and two tablespoons of grated ginger. Add a quart of soup stock, and then add the beets. Bring to a boil and then remove from heat. Let sit for 1/2 hour. Then puree; to serve, add a dollop of sour cream or yogurt. Delicious!! But back to being a newbie: A friend came to visit me at the farm this past week, and after I showed her around the gardens, and explained the tasks we're currently occupied with, she asked if I had gardened much before moving here. The answer is no: I'd pretty much had zero experience gardening. She remarked that it seemed kind of overwhelming, and I realized that during our walk I had been spouting off all these little bits of information that I've learned: the names of different varieties, how to plant or tend certain vegetables, how to put the garden to bed. Hearing her reaction, at the end of the tour, I first felt happy to realize how much I've learned in the last six months, but, then, I worried that I was presenting gardening in a way that was alienating, rather than inviting and accessible to anyone. It's true that farming engages with a great quantity of information--practical, scientific, historical, experiential. 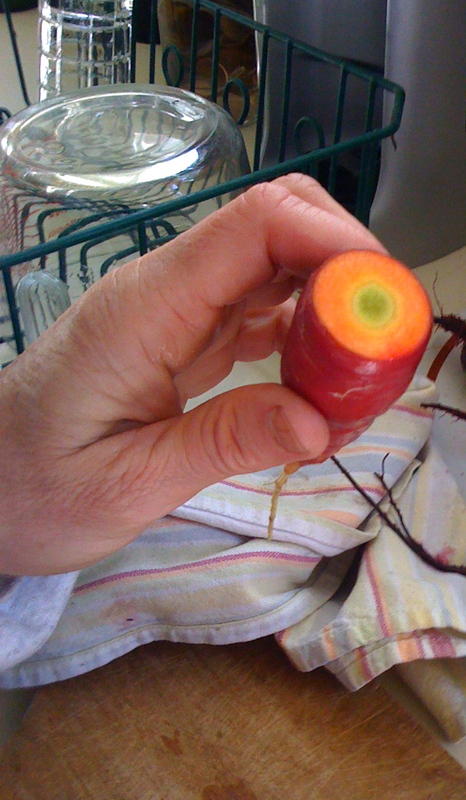 But I do think that we all can grow food, and that we can learn a little bit at a time. I'm lucky to be here with people who've been learning through direct experience (and reference books) for the last five years, and so I can learn from them, as I go. I can talk about many of our crops here, but have direct experience only with a few of them: I've really only planted onions, celery, garlic, and beans. I listen and ask a lot of questions, and I take comfort in the fact that I can look up information on the internet, if I need to remember how many inches apart something should be planted. In fact, I carry my iPhone with me at all times, and refer to it in all sorts of situations...Such as: can you store apples and onions together in the barn? No, apples give off a gas as they ripen which will hasten the aging of other vegetables...Or: how much mulch should you apply around the base of a tree? Ideally, for young trees, all the way to the drip line (as far out as the branches stretch), but not up along the trunk of the tree, because that can rot the bark at the bottom of the tree...And so on, and so on. So, I've been feeling pretty secure knowing that I can look up information that I don't readily remember or know off the top of my head. But then, when I went to start writing this post, I spent about half an hour trying to figure out the correct spelling for a tree that's common around here, and my guesses were so, so, so unbelievably wrong! And my newbie-ness just became plain as day once again. (I had heard people refer to the tree, saying something like "wingawanamus"...and after much searching I finally found the species they were talking about, the Winged Euonymus tree. LOL!). This tree turns amazing magenta, pink, and fucshia colors in the fall. It's amazing how much I don't know. It's humbling, exciting, frustrating.... I'm humbled by it, realizing that I could continue farming for the rest of my life and always have more to learn. There's the basic information about plants--the qualities of the different varieties, what they need and who they like to live near. About how to plant: where, how far apart, what time of year, under what conditions. Then there's information about soil health, mineral composition, soil amendments, manure, mulch... And then there's the whole world of biology, how plants actually grow, what kind of beings are alive in the soil, what they do and what they need, the process of photosynthesis...And the list goes on and on. But the truth is that I could grow lots of things with just a basic level of information. Although there is tons to know, you don't actually have to know a lot to start. So I go to bed each night, amazed and a little dazed at how little I know. It's a good feeling, when all's said and done. While it can be overwhelming to be such a newbie--and not just in terms of farming, as I'm simultaneously a newbie at living in community, at spiritual practices, at believing in abundance, at integrating scientific knowledge into my worldview (I mean, have you seen Carl Sagan's series, "Cosmos"? Holy Moley!!) --I'm also thankful to be so inspired, to be experiencing so much joy in learning, to realize that as I'm turning 39 this year, I am breathing oh so deeply in this vivid world. The colors, beauty, scope and scale astound me. There is so much to learn. I've just started the book, and I'll tell you, it's a challenging read. I had read a series of Kolbert's articles in the New Yorker, a few years ago, and they were shocking, actually. I mean, we hear about global warming and climate change, and we have been experiencing increasingly unsettled weather in recent years. I've read about vanishing glaciers, and endangered polar bears. But this knowledge hasn't really penetrated my visceral, immediate worldview. Somehow, it's possible to know something--in this case, the vast dangers of global warming to our planetary ecosystem--but then to compartmentalize that knowledge away from everyday decisionmaking. Kolbert's articles were shocking, they hit me hard, and I tried to share them with people ("You've got to read this! "), but soon thereafter, I forgot about them. Our ability to forget such things, or compartmentalize them, is one of our real human weaknesses. I smoked cigarettes for years. I knew they were toxic, I knew they were lethal. Yet I continued. In the final year that I smoked, I would treat myself to a smoke after going to the gym, some kind of sick reward. We humans are strange and complicated beings. All the knowledge in the world, though, isn't going to change our behavior, until we see ourselves as part of, integrated into, the natural world, rather than separate from it. We are each of us organic matter, part of the universe, connected through the air we breathe and water we drink. These elements cycle through us and swirl around us. What I do to the air and the water impacts that planetary swirl. We are woven together, and we are creating our future, at every moment, with every breath.